It's the only one you have. You should be proud of your smile. If you’re not happy with your smile when you look in the mirror and pictures are your worst enemy, it’s time to speak to Dr. Montgomery about Boise cosmetic dentistry options that are right for you. From simple treatments like teeth whitening to more extensive procedures, we’re the team for you. The sky’s the limit when you decide to go with Boise Caring Dentistry. Cosmetic dentistry has been used to improve mainly the appearance of your teeth, but the function of them is also a big piece of any procedure. The appearance of your teeth includes not only each tooth but also your gums and bite. Any dental work that focuses on adjusting the shape, position, size, color, and alignment of a single or multiple teeth is considered cosmetic dentistry. 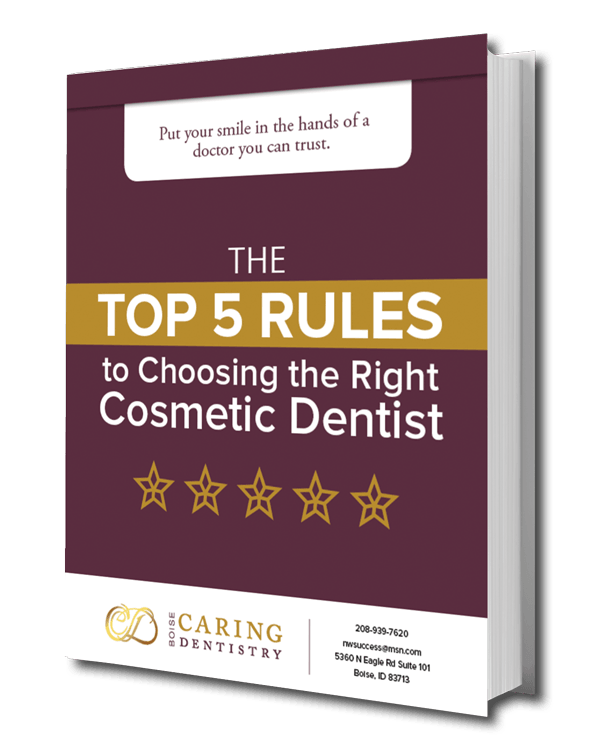 Download your FREE copy of our eBook: The Top 5 Rules to Choosing the Right Cosmetic Dentist. A Great Life Starts With A Great Smile! Contact us today and tell us your smile dreams. Get in Touch | Why Choose Us?